While Rob Papen is known for their synth plugins, that’s not all that they make. In fact, they’ve also created a range of effects, which they started releasing back in 2009 with RP-Verb. RP-Delay was released in 2011, and today we had a chance to check it out. The user interface, which is the first thing that is noticed when any plugin is first opened, looks a little intimidating at first glance for a delay. Most delay plugins have a very simplified set of controls allowing anyone to really install it and use it. Despite this, those who know what they’re doing and what they want from a delay plugin will appreciate the control that they have over the delay sound, and it should be able to give them exactly the kind of delay they hear in they’re head. The far left of the plugin shows the global controls for the delay including the overall volume, mix, length and feedback. These controls are standard on any delay plugin, and should not be too hard to use. Next to that are the controls for the first and second delay for each bank, of which there are 3 (a, b, c). That’s right, the plugin offers a total of six simultaneous delays. The bottom of the interface shows a number of functions. These include envelope’s, LFO’s, step sequencers and so on. The sequencer offers 16 steps, and is a very nice addition to the plugin. RP-Delay sounds awesome, and there are a number of great features that set it apart from other delays. Each delay offers a set of filters and distortion controls, allowing the delay sound to even better be sculpted to what is needed. Each delay also offers different time settings for left and right channels, as well as a tape-delay mode, which is perfect for live situations and eliminates the problem of clicks and pops while changing delay times. Each delay can be set in milliseconds or synced to your project, which is pretty standard for delays but a good addition nonetheless. Another awesome feature of the plugin is called “Rev,” or reverse. When this button is pressed, the plugin basically records up to four seconds of audio, and then plays it backwards. This can add a pretty great sounding sucking effect. While this effect might sound like it’s really only for very specific occasions, it can be more useful than one might think, and it sounds absolutely awesome. Unfortunately, as with all reversing effects, the limitation is that it will be delayed according to how long the recording buffer is set. Luckily, there is one way around this. Simply duplicate the track you want to delay, slide the audio back, and apply the RP-Delay in “send” mode to the new track. Last but not least is the multi-function panel that’s found at the bottom of the plugin. As mentioned before, it has a number of functions, including a 16-step sequencer. It also offers an eight-slot modulating panel, allowing users to route modulation sources to destinations. This offers a lot of flexibility. It would be easier to assume that the multitude of functions that are offered in RP-Delay are to cover up a bad sounding plugin. That thought would be false. RP-Delay is one plugin that happens to offer both a multitude of functions and an incredible sound. 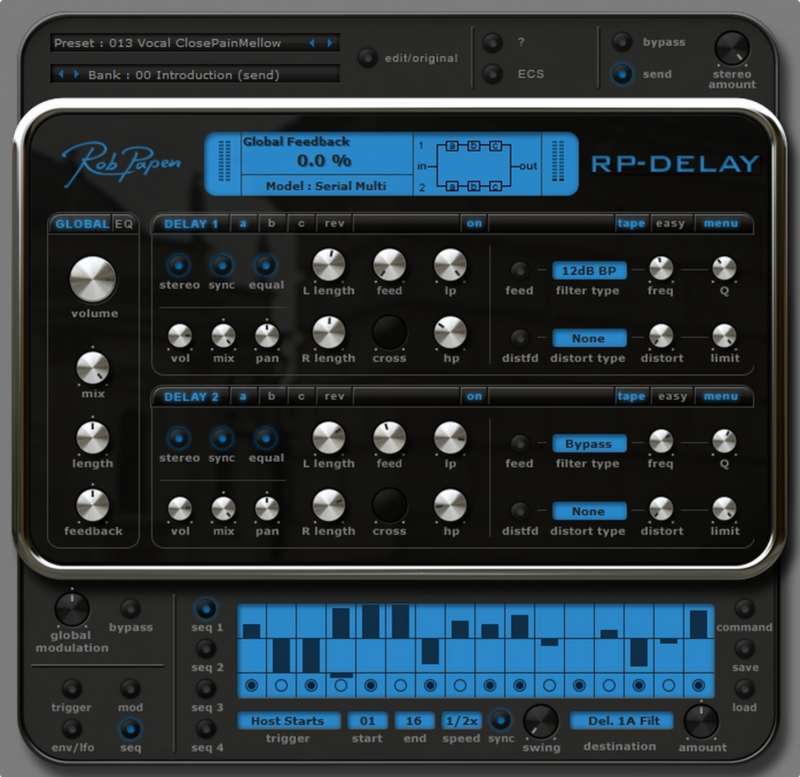 Props to Rob Papen for this one, while we’ve liked all of their plugins so far, RP-Delay goes above and beyond.